The State Corporation Commission’s decision Friday to reject the Dominion Energy Virginia integrated resource plan is just the latest sign the energy package sold by the utility to a compliant General Assembly in early 2018 still has an uncertain future. The State Corporation Commission today rejected the 2018 integrated resource plan (IRP) filed by Dominion Energy Virginia, stamping it “incomplete” and asking the utility for additional information in a supplemental submission. The IRP is only a planning document, and the one for 2017 was just approved by the Commission a few months ago. But in response to the 2017 plan and the massive revision to utility laws by the 2018 General Assembly, several specific directives were imposed for this next plan, which is supposed to have a longer shelf life. The SCC asserts Dominion failed to comply with some of those directives. A raging forest fire is hard to imagine in Northside Richmond, but there could be other emergencies where the city and its residents would come to regret the loss of vehicle travel lanes on Brook Road. A recent deadly fire in California we all watched on television may be giving us a warning. Apparently, evacuations from the lightning-quick brush fire around Paradise, California, were complicated by a 2014 decision there to impose a “road diet” on a four-lane road that became the escape route. The push for “road diets” is also behind the argument for creating new bike lanes in both directions of several miles of Brook Road, a topic of earlier Bacon’s Rebellion posts and furious local debate. A description of the bottleneck created by the highway adjustments in Paradise, and its impact on the fire evacuation, was published on wattsupwiththat.com, an interesting blog I only found because it linked to one of my posts on Dominion Energy. The bottom line problem is that people just like building in dangerous places in California, including fire-prone areas. When I lived in Southern California in the 60’s there were regular local stories about houses sliding into the ocean or homes destroyed by brush fires, only to be quickly rebuilt. The population has grown, development has pushed further into countryside and mountains, and now there are regular national stories. Bottlenecks have already developed on Franklin Street because of its seldom-used bike lane. Just about any activity (parked or parking delivery trucks, leaf removal) in the one remaining travel lane causes a backup. Similar bottlenecks will happen if the Brook Road project proceeds. In both cases there are parallel streets that were not available to evacuees in the High Sierra, but it still calls into question whether safety ever trumps ideology with some people. Next Step, Supreme Court of Virginia? The State Corporation Commission issued an opinion Friday reaffirming its earlier decision that Dominion Energy Virginia must include payments it receives from the PJM regional transmission authority along with the payments it makes to PJM in the separate Rider T1 it puts on all our bills. Following the commission’s August decision the utility filed for reconsideration. The next step, should it decide to take it, is to the Virginia Supreme Court. The amount of money in dispute is minor, so the precedent must be the point. Dominion Energy is seeking to book the payments it is getting back from PJM into base rates, which increases the amount customers must pay in Rider T1 (for transmission) and increases the profit the company earns (and keeps) in base rates – base rates that seemingly will never be adjusted downward again and profits which may never be shared as rate credits again. “Put simply, Dominion seeks to charge customers dollar-for-dollar for these transmission costs through Rider Tl but opposes crediting customers in the same manner for transmission revenues received for the exact same service,” the order reads. Since 2007, more and more of the company’s operations are being paid for with stand-alone rate adjustment clauses outside of base rates. New renewable generation may be funded that way, and the coming rebuild of the distribution grid might be as well. If there are to be silos keeping all the costs in one place, the same silos should hold any and all related revenues to offset those costs. Delays mainly caused by continuing regulatory battles have added another half a billion dollars to the price tag for the Atlantic Coast Pipeline project now crossing Virginia. Dominion Resources CEO Thomas Farrell used a new top figure of $7 billion in a discussion of the project with investors and analysts on November 1. Back in February it was the Duke Energy CEO who first floated a figure of $6.5 billion for a project that started out with a $5 billion or less advertised price. Those costs do not include financing, which will add to the amount customers pay for the gas in coming years. Dominion is the lead partner in the pipeline, along with Duke Energy and Southern Company, but owns slightly less than 50 percent of the project. The transcript is rough in places, the fault of the transcriber I’m sure, so I may add some suggested translations here and there. “The FERC stop work order in (and?) delays obtaining permits necessary for construction have impacted the cost and schedule for the project. As a result, project cost actions have increased the range of $6 billion to $6.5 billion to a range of $6.5 billion to $7 billion excluding financing costs,” Farrell told those assembled on a conference call to discuss the company’s third quarter results. The most recent dispute involves the proposed compressor station in Buckingham County, with its permit decision delayed at the last Air Pollution Control Board meeting. “The Atlantic Coast Pipeline is pursuing a phase in service approach with its customers whereby we maintain a late 2019 in-service date for key segments of the project to meet peak winter demand in critically constrained regions. ACP will be pursuing a mid-2020 in-service date for the remaining segments. Farrell said later their profits are not threatened if they don’t start pumping gas in 2019 because the are guaranteed to recover funds used during construction. “Through this process, we’ve already been through one process with customers on the rates, and we’ll continue to work with them. The returns are going to be very adequate and comments (commensurate?) with the normal returns we get in projects like this in our midstream business,” Farrell said. Dominion Energy Virginia, through another arm of the company, is one of those customers, meaning of course its millions of Virginia ratepayers will ultimately pay off the portion of the pipeline serving Dominion generation plants. Opponents tend to focus on the top line number ignoring the fact that there will be other customers sharing the cost along the line. Opponents are quite right when they point out that new pipelines cost more than old pipelines built at lower cost. Those issues will be debated in future State Corporation Commission cases, where the higher transportation charges will be compared to cheaper alternatives. In speaking to the analysts, Farrell was positive about the prospects of another huge capital expense coming at ratepayers like a train – license extensions to add another 20 years of life for its four nuclear reactors. In some recent State Corporation Commission testimony, the company has been equivocal on its plans. Who’s getting the real story, the SCC or the stock analysts? “Now, on October 16, we filed with the regulatory commission for subsequent license renewable (renewal?) for the [indiscernible] power station reactors. This is an important first step in which we expect will be a multiyear $4 billion investment program that will extend the lives of both the [indiscernible] (Surry?) and North Arizona (North Anna) nuclear stations by an additional 20 years. We expect to submit the North license suspension (extension?) application in 2020. As a result of this initiative, our customers will continue to benefit from clean, reliable and low-cost generation from these best-in-class facilities,” Farrell is quoted in the transcript. Former State Senator John Watkins was actively promoted this past winter as a candidate to fill an opening on the State Corporation Commission. He was apparently derailed by concerns about his votes on key utility regulation issues and his ties to various legislators who have shown little interest in protecting ratepayers when the utility was rewriting the law to its benefit. Yesterday’s Wall Street Journal took note of how things work in Virginia. Apparently that Clean Virginia group published something pointing to relatively high electricity bills in Virginia, and Senator Watkins rose to the company’s defense in a guest column in The Roanoke Times, a paper far from his Chesterfield County home. Read it and form your own opinion of his fitness for the Commission job, which is still open after all. One line of his did inspire me. “Facts are facts, and the SCC does a really good job of compiling them. Legislators and the public count on the SCC to provide that information to make sound decisions,” he wrote. My mission at Bacon’s Rebellion to report on the Commission process and the facts that drive its decisions will continue. Farmland real estate values of conservation easements granted to African-American landowners between 2011 and 2015, as tracked by the Black Family Land Trust. I have to give Governor Ralph Northam credit: It took a lot of guts to remove two members from the State Air Pollution Control Board knowing full well that it would open himself to charges of indifference to environmental racism. Earlier this week, Northam informed Rebecca Rubin and Samuel Bleicher that they would be removed from the seven-member board, reports the Richmond Times-Dispatch. Environmental groups immediately connected the decision with concerns they had expressed about “environmental justice” in the Union Hill community of Buckingham County, where a predominantly African-American community would be exposed to low levels of pollution from an Atlantic Coast Pipeline compressor station. Northam has denied that his decision to replace the two air board members is tied to an upcoming vote on the compressor, but that hasn’t stopped some foes from doubling down on the race card as a way to halt construction of the compressor station and pipeline. “Governor Northam has now officially taken ownership of the Atlantic Coast Pipeline and ownership of this compressor station, a facility which involves strong elements of environmental racism,” said Harrison Wallace, Virginia director of the Chesapeake Climate Action Network & CCAN Action Fund. Apparently, Northam isn’t buying that argument, although it’s hard to know what he thinks because he has not spoken publicly about the environmental-racism issue. The issue can be boiled down to this: About 80% of Union Hill residents are African-American. While Dominion says that the compressor station will have state-of-the-art pollution controls meeting the strictest standards in the state, foes say residents will be exposed to elevated levels of carbon monoxide and nitrogen oxide, putting their health at risk. You can read a detailed explanation of the allegations in a Southern Environmental Law Center letter to Michael Dowd with Virginia’s Department of Environmental Quality. For purposes of argument, let’s grant the proposition that the compressor station would pose a small but measurable health risk. (I don’t know that to be the case, but I want to set that issue aside to get to the meat of my argument.) In a 600-mile pipeline with three compressor stations routed through demographically mixed counties, it is inevitable that the pipeline will encounter minority communities. The standard under federal law is whether African-Americans are disproportionately impacted by the pipeline route. By focusing on the impact on Union Hill to the exclusion of many white communities along the route, pipeline foes have created a new standard: Does the pipeline route impact any African-American community? And if it does, some critics assert, it constitutes environmental racism. I’ve made that point in past blog posts, but now I want to expand on it. The irony here is that one can make an argument that the system promotes social inequity — but not in the way pipeline foes suggest. If you’re looking for disproportionate impact, look at the racial distribution of conservation easements that protect landowners from pipelines, highways, transmission lines and other infrastructure projects from intruding on their land. It doesn’t take a planning Ph.D. to predict that conservation easements as well as the tax benefits and land protections they confer are rewarded overwhelmingly to white landowners — especially wealthy white landowners. The tax benefits are substantial: federal income tax deductions, a state tax credit equal to 40% of the value of the easement, estate tax reductions, and property tax deductions. So generous are the tax deductions that the state has capped the value of tax credits that the Department of Conservation can grant in any one year at $75 million. Easements are in especially great demand by gentleman farmers — owners of horse farms, vineyards and the like — who have spectacular vistas to protect. Small farmers set amidst mundane corn fields and timberland have far less incentive to pursue obtaining the easements. The Virginia Outdoors Foundation, which holds the conservation easements, does not track the race of landowners granted easements. But the Black Family Land Trust (BFLT), which works to conserve black-owned farmland in Virginia, North Carolina and South Carolina, does have data which, though not comprehensive, gives a sense of the number and value of easements granted to black landowners. The BFLT website displays data of easements granted between 2011 and 2015 in 28 designated Strike Force counties, 12 of which are in Virginia. Clearly, that does not represent a complete inventory of all the conservation easements in Virginia granted to black landowners. But the targeting of key counties likely does account for a significant percentage. The four-year total for black landowners in Virginia’s eight targeted counties amounts to $3,o45,000. That works out to an average of $750,000 per year. That’s 1% of the total land value of conservation easements allowed by Virginia law. If we assume that the BFLT captured only half the easements granted black landowners in those years, we can guesstimate that black landowners were granted 2% of the total value of conservation easements and reaped 2% of the tax benefits. African-Americans comprise roughly 20% of Virginia’s population — a disproportionate impact if I’ve ever seen one. When plotting their pipeline routes, the Atlantic Coast Pipeline made great efforts to avoid crossing conservation easements (although in a handful of instances it did not manage to do so). If you’re looking for institutionalized white privilege, there you have it. But the privilege is not that of the pipelines, it’s that of the white landowners. Curiously, pipeline foes and their allies in the environmental movement have ignored this gaping disparity. Why would that be? Perhaps because they are among the primary beneficiaries of the system. Cynics might conclude that the hoo-ha about social justice at Union Hill is purely tactical, not borne of a principled concern for African-American communities. If Virginia’s social justice warriors were truly committed to fighting environmental racism, one might argue, they would target a system of conservation easements that protects wealthy white landowners far more than it protects poor black landowners. But I won’t make that argument. Here’s the argument I will make: I don’t think the racial disparity in the dispensing of conservation easements constitutes discrimination against African-Americans. And I don’t think that the Atlantic Coast Pipeline’s selection of a compressor site in Union Hill constitutes discrimination. The Union Hill community comprises only one of many groups affected by the pipeline. I do think the racial justice angle on Union Hill is ginned up by mostly white pipeline foes desperately seeking any weapon they can to defeat the pipeline project — even if it means aggravating already-tender race relations. And I’m betting that Governor Northam is canny enough to see through the ploy. Update: The Virginia Outdoor Foundation has responded that my view of landowners who take out conservation easements is out of date. Before 2000, a majority of easements were taken out by wealthy landowners who didn’t earn their income from farming/forestry. Today, a majority of landowners getting easements are working farmers. Read the full comment here. The State Corporation today found as a factual matter that the two-turbine Commonwealth of Virginia Offshore Wind (CVOW) demonstration project 27 miles off the coast is imprudent and places unreasonable costs and risks on Dominion Energy Virginia’s ratepayers. It then approved the project citing the clear legislative mandate in an omnibus energy regulation bill passed earlier this year. “The Commission has considered the entire record. The Commission finds — as a purely factual matter based on this record — that the proposed CVOW Project would not be deemed prudent as that term has been applied by this Commission in its long history of public utility regulation or under any common application of the term. The Commission further finds, however, that as a matter of law the new statutes governing this case subordinate the factual analysis to the legislative intent…. In truth, it is hard to imagine a worse factual record, a worse example of wasting ratepayer money and imposing ratepayer risk. For $300 million or more the company will receive only 12 megawatts of power and with the assumed operational efficiency of the turbines that will work out to 78 cents per kilowatt hour. Then a hurricane may wreck it. Dominion’s ratepayers bear almost all the risk of a project design failure except for a limited amount of risk retained by the EPC contractor during the limited warranty period. CVOW’s energy cost is 9.3 times greater than the average cost of the Vineyard Wind offshore wind project off the coast of Massachusetts, which is 8.40/kWh. CVOW’s energy cost is 13.8 times greater than the cost of new solar facilities, which is 5.60/kWh. The Company estimates that the construction cost of the larger scale offshore wind project would be approximately $1.77 billion, excluding financing costs. The cost of energy from large-scale offshore wind is 13.10/kWh, which is also significantly costlier than several other conventional and renewable energy alternatives as listed above. 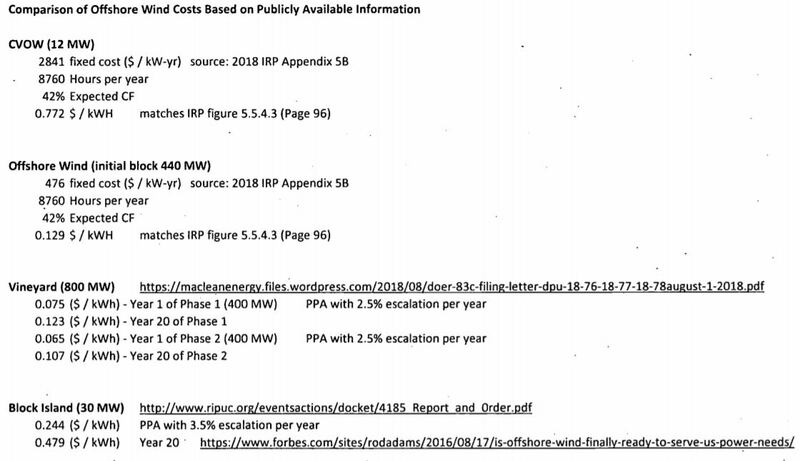 That $1.8 billion estimate for a larger wind field in the same location off Virginia Beach, and the estimated 13.1 cent per kWh energy cost, are numbers that had been held confidential during the proceedings. But the demonstration project will not be using the same turbine technology planned for that larger project and will not have time to demonstrate much of anything before a decision is made on the larger project. The Company asserts that it may seek additional cost recovery from customers if the Project exceeds $300 million. Based on Dominion’s prior CVOW risk assessments, the contingency amount built into the projected $300 million appears low. The order is very specific that only the $300 million initial estimate (excluding financing) is approved, leaving open the question of who pays for any cost overrun or how such an overrun might be treated in a future review of earnings and costs. The $300 million plus financing is money that will not be available for future customer rebates. To further drive home its point, the SCC also approved a Dominion request for a power purchase agreement for 80 megawatts of solar from a third party. The news release paired the two announcements and highlighted that the other project is prudent, was competitively bid, and places the risk squarely on the shoulders of the third party provider. The contrast is clear. The specific phrase is not used, but the general theme in testimony filed with the State Corporation Commission as it considers Dominion Energy’s massive grid modernization proposal is this plan is not ready for prime time. That thread runs through pre-filed testimony from the Office of the Attorney General, the staff of the State Corporation Commission, and an expert hired by environmental groups. They recommend acceptance of pieces and parts of the plan, but none support it all and all complain about the lack of detail on cost and benefits. The SCC will hold a public hearing November 14. About a year ago, with the 2018 General Assembly visible over the horizon, Dominion Energy started its public drumbeat for a major investment in its distribution and delivery system to improve reliability and efficiency. Only later it became clear the plan was, at least in part, also a way for it to keep and invest substantial excess profits, preventing any effort to return those funds to its customers as rebates or lower prices. Dominion in July filed its petition with the SCC seeking a decision on the prudence and reasonableness of its proposed Phase 1, a three-year program with a cost of $917 million, most of it for 1.4 million new internet-connected electric meters. The SCC staff estimated the all-in lifetime cost (with financing and profit) of the first phase at $1.5 billion and the cost of the full 10-year build out at $6 billion. “Based on my analysis, I conclude that the GT Plan is not cost-effective and will result in an economic loss for all customers,” wrote Caroline Golin, a Ph.D. engineer hired by environmental respondents. Golin compared the estimated $2 billion to be spent on ways to reduce outages with the economic benefits of the small improvements to be expected. The average customer will see 295 fewer minutes of lost power over 20 years, she said, and the entire state’s gross domestic product works out to $830,000 per minute. “Following the Company’s logic, the Company is claiming that the value of avoiding of one minute (of) lost power is eight times greater than the entire economic activity of the Commonwealth in that minute,” she wrote. The SCC staff spends its year evaluating utility investment plans and analyzing costs, but their complaint here is there are few firm plans or costs to analyze. “Many of the Company’s cost estimates are based on industry research, bench marking, and data from peer utilities, rather than firm Dominion-specific projections resulting from requests for proposals, competitive bidding, and formal bids from vendors,” wrote Carol B. Myers of the utility accounting division. The SCC staff also complains that Dominion didn’t really ask its customers their opinions on how the modernized grid should be structured. “With respect to the Customer Information Platform, any approval should require the Company to perform a formal outreach to Virginia customers to solicit and incorporate their feedback on their desired features, including self-service options, prior to rollout,” wrote the SCC’s David N. Essah. Golan, hired by Appalachian Voices and the Southern Environmental Law Center, pointed to an existing customer interface called Green Button as the benchmark Dominion ignored. The complaint that this plan serves the company but not the customers and could impede the spread of customer-owned generation resources was also central to a published critique which is not part of the SCC’s case record.